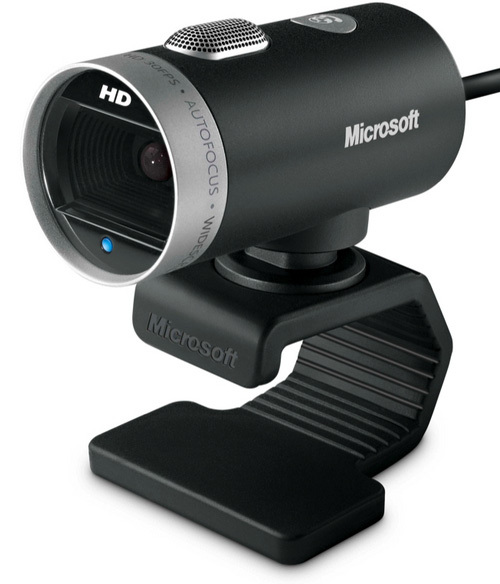 Microsoft's LifeCam Bumped To 720P – Now Dubbed The 'Cinema' | OhGizmo! Yesterday Microsoft announced a new version of their LifeCam webcam known as the Cinema which boasts an ‘HD’ resolution of 720P, or 1280×720 at 30fps. With a price tag of $79.99 it’s definitely not the discount bin webcam you’ll find at your local computer shop, but for that money you get an aluminum housing, a real glass lens that’s harder to scratch than plastic, auto focus, a noise-cancelling mic and a Windows Live call button making it extra friendly with Windows Live Messenger. And since HD video does require a bit of horsepower, the minimum requirements for the LifeCam Cinema is a dual core 1.6GHz processor system, though they recommend 3GHz, and 2GB of memory. But since it’s not scheduled to hit store shelves until September 9th, you’ve got plenty of time to upgrade. Here are some Tags: Video Cameras, Webcam. Nice cam dude. Really a good one, thankx for shating.